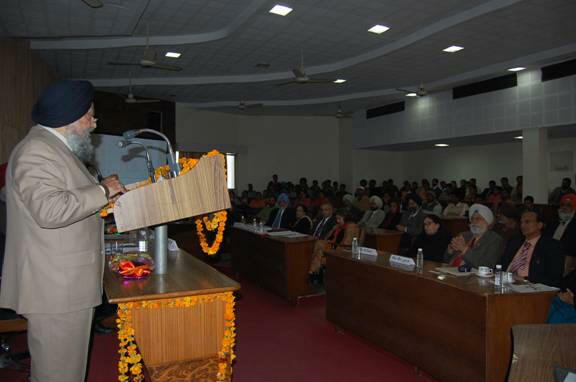 While delivering the first ‘Shaheed Nanak Singh Memorial Lecture’, Dr HK Manmohan Singh, emeritus professor and former Vice-Chancellor of Punjabi University, said “When established cultures and civilizations undergo a radical change, they generate debris of conflicts, tensions and problems that can be grasped and overcome only with the help of the teachings of great spiritual masters.” Dr. Singh said all these values were upheld by Sardar Nanak Singh, who made a phenomenal sacrifice to promote religious tolerance and human freedom, even as he was done to death in the pre-partition carnage while trying to save some students of a school, who had organised a peace march against the division of the country. A science and a law graduate, Nanak Singh could have continued his career with the British police, but his upbringing as a devout made him revolt against his submission to the wrongs being perpetrated, first by the rulers and then by the fundamentalists who wanted to divide the country on the basis of religion. 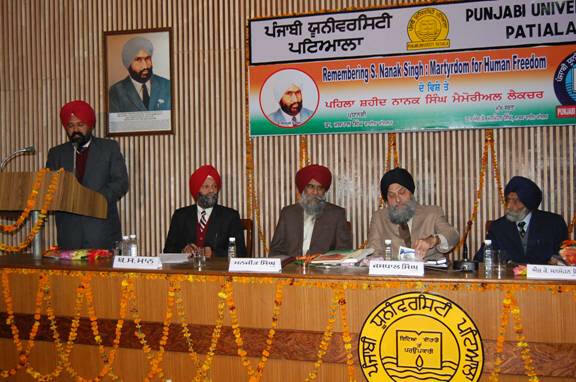 In his presidential address, Vice-Chancellor Dr Jaspal Singh said that concepts of a pluralistic and multi-ethnic society were essential features of Sikh religion for which Sardar Nanak Singh stood for as an ideologue. The VC said no nation in the world could afford to see India getting disintegrated as all values of religious harmony, which were the quintessence of peace in the world, would perish along with it. 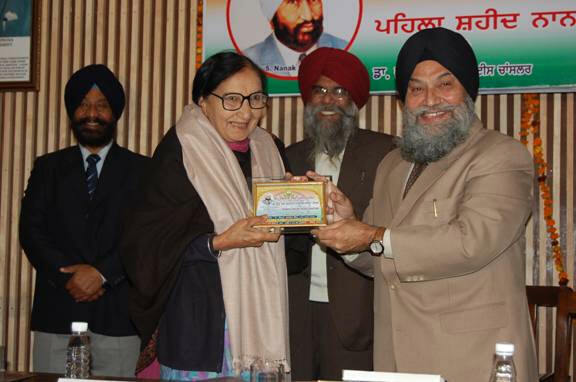 Even the purity of socio-economic growth and good governance could not be perceived without following the well laid out principles in the Sikh scriptures, Dr Jaspal Singh said. The social and religious conflicts could easily be avoided if the precepts of true religions are judiciously followed, he added. The Vice-Chancellor presented mementoes to the family members of Sardar Nanak Singh as a token of respect. 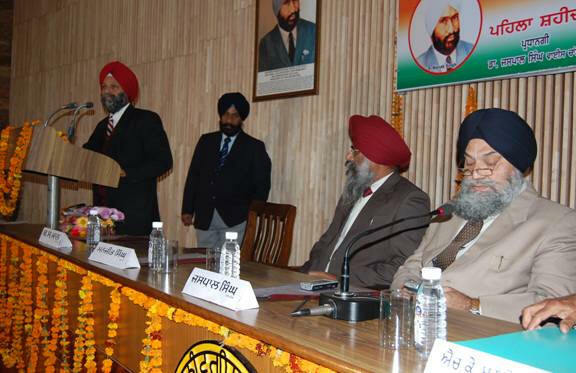 Dr Manjit Singh, Dean Colleges of the University, while describing Sardar Nanak Singh as a great visionary, said such sacrifices acted as source of inspiration for others to be emulated. Dr Kulbir Singh Dhillon, Dean Students and Dr Baltej Maan, Chair Professor of the GTB National Integration Chair also spoke on the occasion. 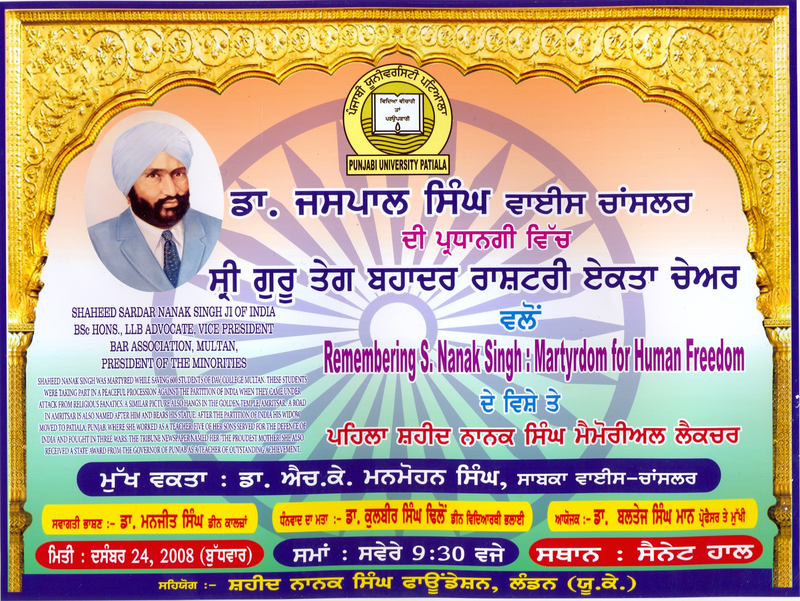 The First Shaheed Nanak Singh Memorial Lecture. Guests standing for the National Anthem. 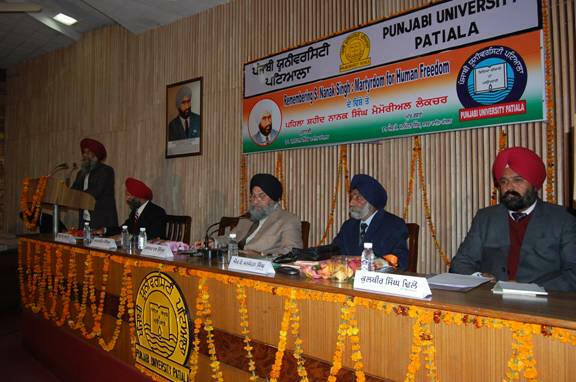 The First Shaheed Nanak Singh Memorial Lecture held at the Punjabi University Patiala. Don’t Break up India ’ to VC Dr. Jaspal Singh. Don’t Break up India ’ to Dr. H.K. Manmohan Singh. 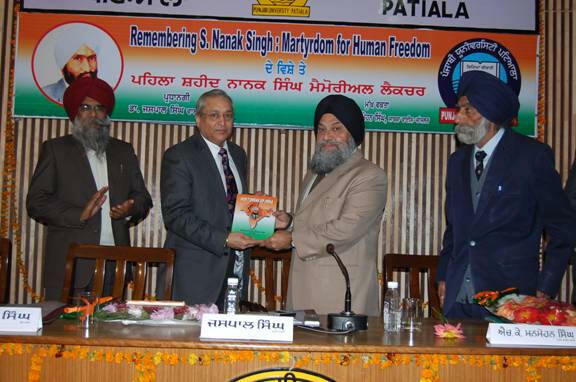 Shaheed Nanak Singh Plaque from VC Dr. Jaspal Singh. 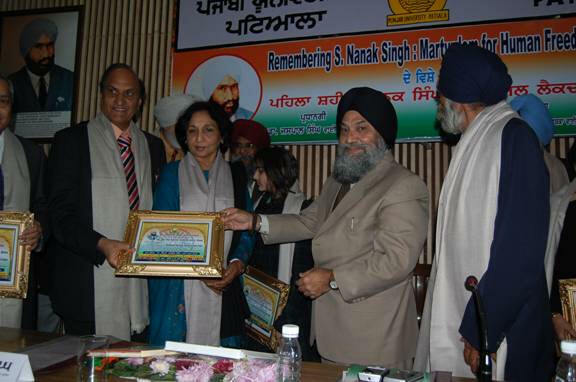 Shaheed Nanak Singh plaque from Dr. Jaspal Singh. Family and Friends of Shaheed Nanak Singh Foundation at the lecture. 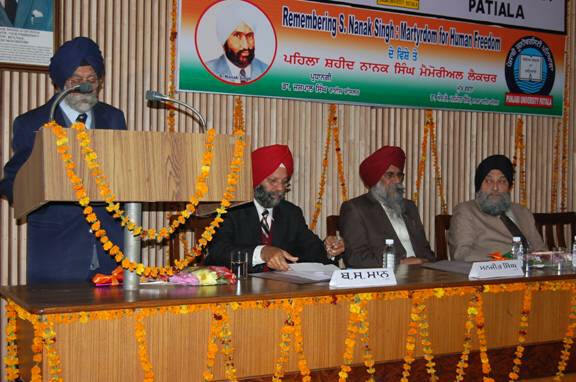 Dr. Baltej Singh Mann, Chair SGTBNI addressing the guests. 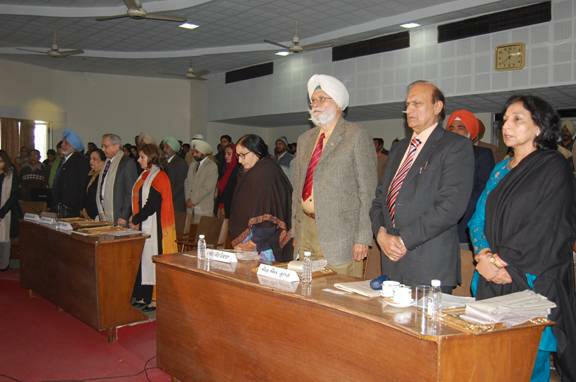 guests and dignitaries at The First Shaheed Nanak Singh Memorial Lecture.